Jackson Maine is a celebrated musician who regularly performs at sold-out concerts. He is an alcoholic, but has been able to keep this vice away from the prying eyes of the public. Ally is a young singer-songwriter who works as a waitress with her friend, Ramon. She also moonlights as a singer at a drag bar. One night, Jackson pays a visit to the drag bar so he may witness Ally’s singing firsthand. Impressed with her talent, they share a drink whereupon Ally reveals she has never considered pursuing a professional career due to being told she has a big nose. Jackson asks Ally to come to his show. Though hesitant at first, she does take him up on his offer whereupon Ramon convinces her to go out and sing on stage. This snap decision will signal the beginning of a promising career |and the end of a dying one|. Bradley Cooper’s take on A Star is Born is notable for being the fourth version of the 1937 film starring Janet Gaynor. The original film and its first remake, which starred Judy Garland, revolve around Hollywood. Meanwhile, the 1976 version starring Barbara Streisand turned the story into a musical. Accordingly, the trials and tribulations the protagonists faced were based within the music industry instead. However, while the 1976 version was a straight-up musical, the singing performances in Mr. Cooper’s version typically exist in-universe – it’s not as though random strangers spontaneously break out into song. Furthermore, whether it’s Hereditary, Searching, or Blindspotting, 2018 seems to have had an inordinate number of acclaimed directorial debuts. They have covered a gamut of genres from horror to suspense. However, A Star is Born is a little bit different. While the people behind most of the other films were nonentities until their work debuted on the silver screen, Bradley Cooper is a name anyone who has seen any acclaimed films within the last few years will know. Interestingly, he originally aspired to be a director before turning to acting, so this was his big chance. On that front, I would deem A Star is Born a solid directorial debut. He turns in an excellent, dynamic performance that does his character’s arc justice. He’s hardly in short company, for standing alongside him is Lady Gaga as Ally. Given the larger-than-life quality of her most famous tunes, I could scarcely believe it was her in the trailers I saw – I wouldn’t confirm it until I read a cast list on Rotten Tomatoes. She too is perfectly in-sync with her character. She and Bradley Cooper have an excellent chemistry together that really make the relationship between their characters equal parts believable and fascinating. On that note, Andrew Dice Clay’s performance as Ally’s father is something that needs to be seen to be believed. I heard he was in the film going into it, yet I forget he was even in the film until I saw his name pop up in the end credits. I have to admit of the four versions of A Star is Born, this is the only one I’ve seen, so I don’t know how it holds up when compared to its predecessors. Nonetheless, it was a very solid film that sticks out as one of the better efforts of 2018. 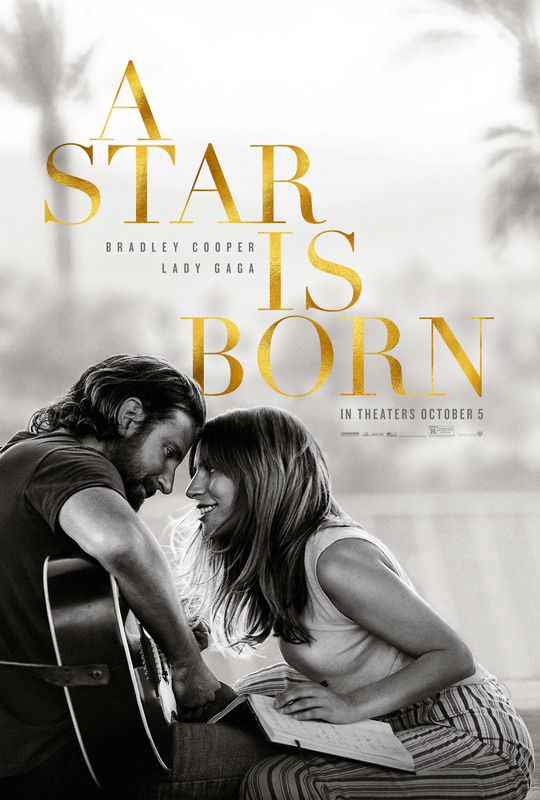 With a good soundtrack, a compelling story, and a treasure trove of great performances from unexpected sources, the 2018 version of A Star is Born is worth a watch. Greenhorn homicide detective Murakami hasn’t exactly gotten his career off to a promising start. On a crowded trolley ride, a pickpocket has made off with his Colt pistol. He tried to chase after the thief, but lost him. With great remorse, he reports the theft to his superior. Deciding to make amends for his failure, he goes undercover, eventually picking up the trail of a gun racket. Shortly after the forensics officers discover that the stolen gun was used in a recent crime, Murakami is partnered up with Satō, a veteran. This duo is now determined to recover the stolen firearm before any more harm can be inflicted because of it. Like Drunken Angel and The Bad Sleep Well, Stray Dog was a film I had been meaning to check out for some time, but for one reason or another, I didn’t quite get around to it. All three films are included on a European compilation known as the Kurosawa Crime Collection along with High and Low. Though I lack the means to obtain it myself, I figured after having watched the other three entries that I may as well round it out by watching Stray Dog this past weekend. I was especially interested to see Mr. Kurosawa’s take on the film noir genre, as one doesn’t see many non-United States or non-European examples. Talking about Stray Dog in regards to its creator’s standpoint is an interesting subject. Despite its acclaim, Mr. Kurosawa wasn’t as enthusiastic about this particular work – at least not at first. He initially said that he considered it “too technical” without any real thought or style being put into it. Unlike other similar cases, he did eventually warm up to it by 1982 as he was writing his autobiography, citing its smooth production, the high spirits of the cast, and good pacing. I have to admit I was a tad wary going into Stray Dog, having witnessed the disappointing The Bad Sleep Well two weeks prior. Like Drunken Angel, Stray Dog takes places in a postwar Tokyo. You get a sense of how difficult things were for the civilians back then simply observing the dilapidated scenery. What’s remarkable is how these feelings are conveyed without anyone feeling the need to directly comment on it at length. In a lot of ways, both films remind me of The Third Man, which was set in a bombed out Vienna. However, while Drunken Angel was good, I felt Stray Dog was a marked improvement. The following year, Mr. Kurosawa would leave an enormous impact on fiction with Rashomon. However, what is easy to overlook is that Stray Dog had a more silent effect on the medium – one that wouldn’t fully manifest until a few decades later. Specifically, Stray Dog is considered a precursor to the buddy cop film. The leads are two men with very different personalities. Murakami is the idealistic newcomer while Satō is the wary veteran. The contrast isn’t as drastic as a typical example because both characters are determined to bring the criminal to justice and don’t have that patented fight in the second act that tears apart their working relationship. The story is honestly better without that fight because it would’ve been tonally jarring. Plus, even without it, the two leads, played by Toshiro Mifune and Takashi Shimura, have an excellent dynamic. Their characters have two distinct viewpoints, yet they know when to put their differences aside and act like true professionals. Stray Dog is also a bit different from a typical buddy cop film in that it takes its time introducing the deuteragonist. The first thirty minutes detail Murakami’s futile search. Though it drags on for quite a while, I personally liked that the film wasn’t in a hurry to throw its vital elements out the door. Indeed, by showing the viewer just how poorly the search is going at first, they get a sense of the sheer difficulty awaiting Murakami and how much the knowledge that his own firearm is being used to commit heinous crimes is tearing him apart. Speaking retrospectively, it’s strange seeing Toshiro Mifune playing the naïve newcomer; his most famous roles cast him as the ace – whether or not things turned well for his character depended on the film. Nonetheless, I feel it’s highly appropriate from a meta standpoint, for it could be considered a parallel to the acting experience he would gain. One of his earliest roles cast him as a greenhorn, and a few years down the line, he would regularly be cast as the man in charge. All in all, it’s kind of a shame that Stray Dog isn’t as well-known as Mr. Kurosawa’s other films because I thought it was great. It has a strong cast and manages to tell a dynamic, compelling story without ever feeling the need to go overboard, and you will be rooting for the leads every step of the way. For film noir fans, this is an essential watch, and if you’re seeking out a gateway into the genre, it would be an excellent one to start with. ← September 2018 in Summary: Super Mario Bros. Month is Complete!